With all of the drama that has occurred over the last several days in the baseball world, it has seen its first elimination – the Detroit Tigers were swept by the Baltimore Orioles in three games. Baltimore will move on to the American League Championship Series to play the Kansas City Royals, who eliminated the Los Angeles Angels on Sunday. Motown was ready for playoff baseball to return, and the sounds of postseason baseball were just as sweet as ever before. 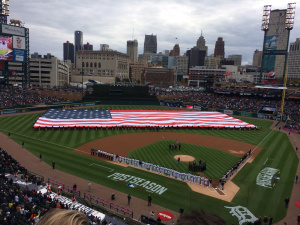 The Tigers were favored by many (based on preseason statistics) to win the World Series this year. A multitude of things didn’t click for the them, which ultimately cost them the American League pennant, as well as some of their key players for next season. Almost anyone would tell you that the Tigers’ lack of success both in the postseason and regular season came down to an atrocious bullpen. Big names such as Joe Nathan, Joba Chamberlain and Joakim Soria embodied the Tigers bullpen, but none of them lived up to their previous big league seasons. Chamberlain and Soria gave up a combined nine runs in just 1 1/3 innings, which turned a 5-3 lead in game one into a 12-3 loss for the Tigers. Chamberlain’s final line for game one was: 1/3 IP, three hits, four earned runs, 0 BB, 0 K’s , a 9.00 WHIP, and a 108.00 ERA . Soria’s game one final line was: 1 IP, four hits, five earned runs, 2 BB, 0 K’s, a 6.00 WHIP, and a 45.00 ERA. I think it’s safe to say that the Tigers bullpen did not show up in game one, or for the rest of the postseason for that matter. The Tigers did not play terrible defense against the Orioles, but many writers and critics would say that Andrew Romine’s eighth inning error in game one opened the floodgates for Baltimore to pour on runs. With runners on first and third, what should have been a routine double play ground ball that would have only allowed one run turned into an inning of a nightmare. Had the double play been turned, there would have been two outs and only one run would have scored. Instead, because of the error, the run scored, and the Orioles had runners on first and second with nobody out. Another huge reason for the Orioles steamrolling the Tigers this year was their offseason addition of designated hitter Nelson Cruz. Cruz has been a thorn in the side of the Tigers for a few years now. In this series alone, he had a .500 batting average with two home runs, five RBIs, and a 1.000 slugging percentage. In his career, Cruz has collected a .412 batting average against the Tigers in the postseason, as well as eight home runs and 18 RBIs. His two-run home run in game three was enough to push the Orioles past the Tigers, winning by a score of 2-1. That home run also tied Cruz with Yankees outfielder Carlos Beltran for ninth all-time on the postseason home run leader board. Not only did Cruz do his job at the plate, but the rest of the Orioles had good plans at the plate. As a team, the Orioles batting average for the series was .263, a respectable mark for the postseason. Comparatively, the Tigers batted just .218 in the series, and their on base percentage was over 60 points lower than the Orioles’. “They [Baltimore] have an order, one to nine, that can hit home runs, and absolutely mash the ball,” Mowery said. Experience also played a role in the Orioles’ success over the Tigers. Orioles manager Buck Showalter has been a manager for 16 seasons, including this year. Thi is his fifth season as the Orioles’ manager. Tigers rookie manager Brad Ausmus had never managed any team before this year, let alone a major league team. Ausmus played in the 2005 World Series with the Houston Astros, but managing a team is a much different task. As a whole, the Detroit Tigers were not a fundamentally sound team, at least not enough to win a World Series. The Orioles out-pitched, out-hit, and overall, outplayed the Tigers in this series. While the Tigers will go home for the rest of October, the Orioles will continue on to play the Kansas City Royals in the American League Championship Series at Camden Yards, starting on Friday at 8:07 p.m.